Before we get going with this solar panel installation guide – especially with MYSUN – we are sure you are wondering why should install a solar panel at home in the first place? Now that we have introduced you to the massive list of benefits that can be accrued from solar panel installation, let us get down to how do you go about getting this magic in your world. Here’s a guide detailing how to install solar panels step-by-step. Step 1 - Review the physical installation options. Do you have room on your roof or on your property for solar panel installation? If yes, then how much area (in sq. ft. or sq. mt.) would you be able to spare? Would you rather have panels on your rooftop or on the ground where you can reach them easily? Does the sun shine bright on this area for most of the daylight hours? Do shadows from trees or other structures fall on this area at certain parts of the day or not? Is your roof structurally sound enough to bear the weight of solar panels and racks? Will you be able to orient your solar panels towards south, so that the winter sun hits the panels in the most optimally perpendicular manner possible at noon? Now that you have assessed the physical installation options, the next step is to calculate how much power you would need once you install a solar panel at home. Since solar panels are measured by how much energy they can absorb, this will tell you how many panels to buy, how efficient they need to be, and perhaps – most importantly – how much space you're going to require for solar panel installation. Don't worry; this process is no longer complicated thanks to our advanced tool MYSUN Calculator where just in a few easy steps, you can get a fairly accurate assessment of your solarization potential and can also get a personalized solar scorecard. Step 3 – Grid Tied or Off Grid System? Next up is a step that’ somewhat technical. But do not worry, we have simplified solar panel installation for you under our FAQ and Solar Essentials sections. And if you still have queries, we are just a click away (write to us at [email protected]). It is time to decide between a Grid Tied (On-Grid) or an Off-Grid System. Grid Tied or On-Grid: An on-grid system is a form of solar panel installation which is interconnected with your existing electrical system. The solar energy generated is simultaneously consumed, and if the solar panels are not generating sufficient energy to cater to your consumption needs, the differential is automatically sourced from the grid. It is also possible to connect the system with batteries, home inverters, diesel generators, etc. Off Grid: An off-grid system is an independent, battery-backed solar panel installation system which is not connected to any grid. During daytime, the solar energy that’s generated runs your appliances. Any excess energy is stored in the batteries, which can be utilized at night. Off-grid systems are used for standalone applications like traffic & streetlights, billboards, agricultural pumps, telecom towers, rural applications, etc. 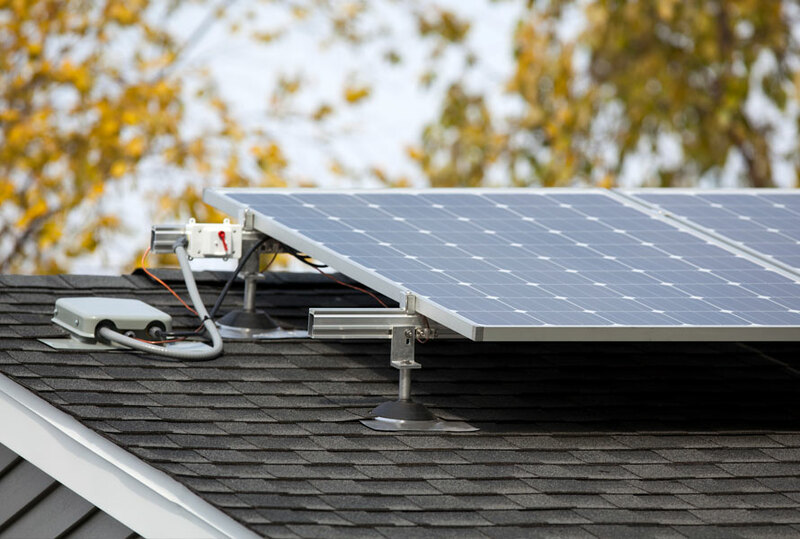 Now that you know the difference between grid-tied and off-grid systems, you need to decide what kind of solar panel installation system is appropriate for you. After load calculation and deciding what kind of system fits your overall solar panel installation requirements, you can easily check how much the process to install a solar panel at home is going to cost you. You must also determine recurring costs and performance estimates for PV systems, including maintenance costs, system lifetime, expansion potential, warranty, and so on. Once you have the cost, you have to make a choice; whether you are going to spend the money out of your pocket or are going to look at financing options. MYSUN provides the best industry benchmarked pricing to you along with options to finance your solar panel installation cost as per your convenience. Now that the money is in place, it is time to locate contractors and go out for formal bids. Our suggestion to you is to talk to as many contractors as you can, and ask them as many questions as you can think of. Get them to give you a personal visit at your house/office/ building and look at your solar panel installation situation in greater detail. Do not give anyone a contract to install a solar panel at home unless and until they have given your place a personal visit and assessed the area and location thoroughly. Also, make sure you deal with experienced, quality and reliable installers only. MYSUN brings to your fingertips the entire process of receiving and evaluating quotes from different pre-screened solar installers to get the right quality and commercial terms. Permits are usually not required for off-grid systems or on-grid solar panel installation systems for captive consumption. For on-grid systems, if you choose to go for net metering or gross metering, certain approvals are required. These approvals usually vary from state to state and depend on the type and size of solar panel installation. Your solar system installer will either guide you in this process or take up ownership of this process. Your solar system does not need too much of maintenance, but it is still important to take care of a few things. Cleaning the solar panels is a critical aspect to ensure good performance from your system. And as with any mechanical or electrical appliance, PV systems require some routine and periodic checks, though not very exhaustive. You may be able to carry out many routine inspections and maintenance tasks yourself. If, however, you are not the do-it-yourself types, or if there is a major problem with your solar panel installation system, you will need to locate a professional to do the work. Keeping an eye on the generation will help you catch any potential problem early and thereby avoiding you any major energy generation or savings loss. Home solar panel installation is not very complicated, and it isn't terribly expensive either. In the long run, you can save a lot of money on your energy bills, and even make money by selling power back to the utility company. Once you know the parts of a solar system, the entire process is much less intimidating - it's just a matter of adapting the formula to your specific situation. You are always invited to stop by itsmysun.com for more learning articles, solar news stories, affordable solar systems and components, or if you have any questions, for a solar expert. And if beyond all this, there is anything that is related to solar and you were unable to trace back in the article or on our site, remember we are just a hello away using the Contact Us page or our Social Media platforms. This article is put together by Team MYSUN. With a diverse experience of many years in the world of Solar and a flair for writing, the article put together, showcases our views after thorough research and domain expertise. You can always reach out to us with your feedback, suggestions or queries using the Contact Us page or our social media handles. Hi Jaywant, Thank you for your interest in MYSUN. For any query, please feel free to reach out to us at 0120-4753500. We have shared the details with you over an E-Mail. Pls check. I am interested in installing roof top solar panels. I even contacted some local people in my city. They promised they would come and work out an estimate/economies for me. But no one ever turned up. Could you perhaps help? I want to install solar system on my roof top of 500 watt. Please share price details and process for this. Thanks for your query. We have deleted your number in respect of your privacy.